Irudayammal Kagoo Poobalarayen a�" wife, Aatha, mummy, maami, grandma, Pooty, akka, periyamma, ammai, aunt, aththai, chiththi, friend, crochet artist, cook par excellence, seamstress, avid reader of Tamil fiction and prayer warrior a�" passed away peacefully on October 3, after a brief illness. She was 97. Her name "Irudayammal," which in Tamil means 'heartful mother' could also have easily meant "mother of all hearts," since it exemplified the way our mother and grandmother lived. James, her late husband, had anglicized her name and called her "Hearty." The word "hearty" means jovial, exuberant, spirited, amongst other things. She was all of this; and so much more. Her own version of "heart-fullness," however, was grounded on welcoming and loving the stranger. For Irudayammal, the possibility that the stranger could become family, and familiar, was ever present and this seemed to be the guiding principle of her life. Irudayammal and her husband, James, shared a love that was both wide as it was deep; and this love radiated out to those around them. Their love was unusual for its time because they were friends, collaborators, and most importantly partners. The story goes that even when she would sew a dress for one of their daughters, they would collaborate and consult each other on color, fabric, pattern, and style. But their life together was not without its challenges. They migrated to Colombo, Sri Lanka, in the 1940s, from their "oor" in India, Virapandian pattnam. They lived in Colombo for almost thirty-five years but had to return to India in 1978, when the Sri Lankan government refused citizenship rights to Indian Tamils and demanded they return to India. Irudayammal and James left from Talai Mannar, this time without all four of their children. But back in their "oor," they soldiered on, struggling at first but eventually thriving with their new-found sense of community. 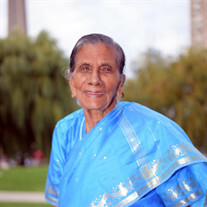 When she lost James in 1983, Irudayammal shuttled between Pattnam and Colombo and eventually migrated to Canada, so she could be with her children. Throughout her time in Toronto, she longed to return back to her "oor," which was ultimately home for her. Irudayammal's love for her childrena�"Milton, Dorothy, Indira, and Newtona�"was unparalleled. She extended this love to all those who entered the family, including her beloved sons-in-law and daughter-in-law. She was selfless to a fault; and her mothering was based on a form of care that involved a ceaseless laboring. In her younger days, when we would visit her in Pattnam, it was hard to find her sitting down. She could be found cooking, feeding her grandchildren, washing, or shopping for things in the Thiruchendur market. This care extended to her great-grandchildren as well; and was apparent in the way she greeted us all. It was either "Enda Thangamme! Vanthiteengala!" which translates to "My golden child! You've come;" or "Saappitiya?" which means, "Have you eaten?" Whenever she visited her great-grandkids, she came laden with chocolates and biscuits. For Irudayammal, feeding her family was an expression of love. She was an innovative cook, who had the immense ability to whip-up something out of nothing. And if someone stopped at her house during meal times, she would insist that they stay for food, going so far as to literally feed them. Accounts of Irudayammal's feeding of nephews, nieces, grandkids, great-grand children and neighbors is now legendary and will surely become part of our family's folklore. But her cooking also reflected her sense of self. Irudayammal had received an education up until 8th grade. This was unusual in those days, when female education in India was still in its infancy. In fact, she was sent to boarding school by her family, which was even more uncommon. While her formal education ended at the age of 14 or 15, Irudayammal never ceased to learn. Her cooking and her desire to constantly re-invent old recipes and collect new ones was a clear sign of her imagination and her deep yearning for new ways of doing things. Her cooking repertoire extended from Western cakes and desserts to different versions of the South Asian meal. One recipe she never tired of talking about (and making) was 'rainbow rice': each plate was assembled with the meat curry hidden under a pile of rice; and the veggies were arranged on top of the rice to resembled the colors of the rainbow. The aesthetics of the arrangement gave her an added sense of pleasure. Her sharp eye for color and design also surfaced in the crochet artist she was. She crocheted until the day she was taken to hospital. A familiar image of Irudayammal stooped over a crochet pattern--counting stitches for her current project with spools of wool around hera�"is one that is indelibly etched in our consciousness. She knitted everything: baby blankets, table cloths, shawls, scarfs, hats, doilies, booties and so much more. If we were able to trace the people to whom she gifted these crocheted items, we would truly understand the extent of her heart-fullness. When she was done with a project, she was also very proud to show it off. Using her imagination as well as newly acquired knowledge to make things was central to Irudayammal's sense of self, and we benefitted from her precocious vision. Finally, Irudayammal was a woman of deep faith. If her imagination ruled every other aspect of her life, her faith may have been something that was not up for negotiation. She was a steadfast Catholic and insisted on attending mass, reading the bible, and praying every day. But her faith was not confined to her religious practices alone; she lived-out her faith by being present to those in dire need. Loving her neighbor as herselfa�"perhaps, even more than herselfa�"was a commandment she took to heart. For Irudayammal, being a neighbor meant extending care to all those around her. And it is because of this that we can call her our mother of all hearts. Irudayammal is survived by her children Milton (Darshini), Dorothy (John), Indira (late Denison), and Newton; her grandchildren Camillo (Hena), Kathleen (Channa), Nedra (Paul), Fiona (Romain), Dellano (Shaarmina), Mireille, Dinu(Susitha) and Minoli (Geeth) and Chantelle; her great grand-children: Chiara, Achal, Christian, Sulekh, Herra, Jasper, Stephen, Christie, Kathy, Raffy and Paul. A Funeral Service will be held at Our Lady of Peace, 12601 Shaker Blvd., Cleveland, OH 44120 on Saturday, October 7 at 1:30 PM. FRIENDS MAY CALL ON SATURDAY, OCTOBER 7 AT THE CHURCH FROM 11:30 AM TO 1:30 PM.